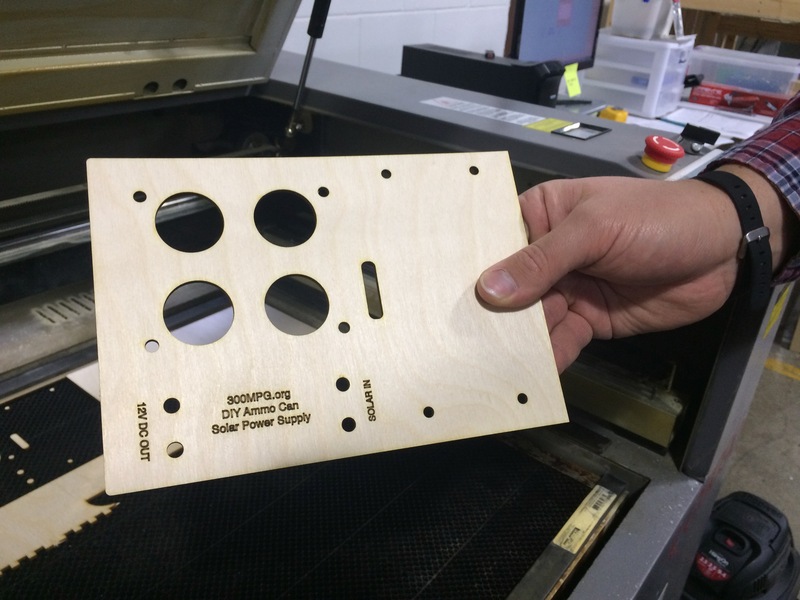 There has been interest in the wood face plates for the Solar Ammo Can Project. These are laser-cut 1/8″ baltic birch. We now have a supply of these made available for sale. Face plates are $10 each and INCLUDE shipping in the United States. Please use the DONATE link, enter the proper amount, and make sure to include your full name and mailing address. How long is the run time on this with a full charge while cutting? The tractor, with it’s current 6 x 12V batteries has over a one-hour mowing run time. (My yard takes about an hour to mow, and there’s still juice left.) Original battery pack system was designed to mow 3.5 acres per charge. I called to ask about the E10. Just wondering if it is still for sale. Sorry I missed your call. Yes, the tractor is still for sale. Please call me again when you get a chance. Congratulations to Seth on buying the E10! It is absolutely amazing and although it isn’t an electric vehicle per se, I had the EV grins the whole time I mowed my lawn. For those of you that passed on it I recommend going out right this instant and buying an electric lawn mower. I can’t even begin to thank you enough for the amazing chance to meet you Ben and this magnificent machine. they arent cheap at $150 + each ,hows your bike liking them? The Leaf cells have been great in the Vectrix! Hi. Sir Ben. I will like to have this system for my parents in PR they still have no power yet. Since the huracan Maria. Can you send me information. Or able to prepare this system for me ? I am not building and selling these units, they are a project anyone can make for themselves by using the components listed and my directions. If you just want to buy the wood faceplate from me, I can sell it to you and ship it to the United States and Puerto Rico. I would like to purchase 2 of the laser cut faceplates. I have tried several different layouts and yours is by far the neatest and most functional. I will be using it as a portable power supply for my HAM radio emergency “go-kit”. I’m also an amateur radio operator (and avid camper!) and I’m very interested in building a few of these boxes for the campsite and radio work. I’d buy three of the laser cut faceplates if they’re still available. I hope you’re healing up well – take it easy and don’t push too hard! I’m fresh out of the faceplates. Ill get some more made up. Just give me a little time. I’m very slowly getting back to anything approaching “normal”. I’ll let you know when I have them. Hi Eric, I just made a fresh batch of faceplates. Faceplates in stock if I order two (2)? Yes, I have a number in stock right now. Ben, I have built and flown a 2 seat low wing airplane with a 65 Corvair 164 cid engine. This is about 100 hp. Now that aviation fuel is @5.40 per gal. I can barely afford to taxi, much less fly. I am considering an EV conversion. My calculation result in a 60Kw continuous 80Kw peak running the prop @ 3200 rpm with a battery pack of about 40 Kw for a fly time of about 4 hours. My plane plan without the current engine, fuel tank, engine mount and engine associated accessories is about 350 lbs, so I have 400 lbs for all the EV components. I am looking at A123 LiFePO4 pouch batteries as the lightest for the battery pack which I can build, but need advice on a electric motor that is affordable, lightweight and has the above power requirements. I would appreciate any comments or information you would provide. I don’t know anything airplanes, but I can tell you who does – The Experimental Aircraft Association! I haven’t been up to the event, but they’ve had electric airplanes there the past couple of years. Lightweight and high power are definite requirements for aircraft! Hope that helps get you started!